There was once a chorister who attended Zennor church called Mathew Trewella. 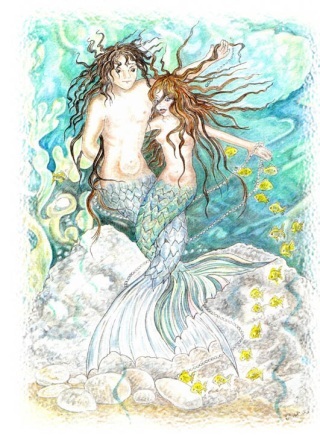 He sang so beautifully that it attracted the attentions of a mermaid out at sea. She crept into the church while he was singing and became so enamoured of him that she was determined to use all her powers to win him. Every Sunday the mermaid waited for Mathew outside the church and they would walk back to the beach together. One Sunday Mathew did not arrive for the service and all the inhabitants of Zennor knew that he had followed the beautiful mermaid back into the depths of the sea. Often on a still night his voice can be heard coming from under the waves of Pendower Cove singing to his mermaid bride. 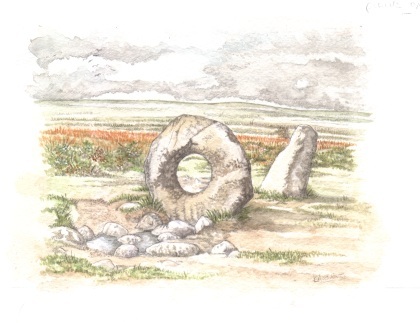 The granite Men-an-Tol or Holed Stone lies 2½ miles from Madron. This stone was the entrance to a tomb chamber and the stone itself possesses healing powers. Young children are passed through the hole, naked , nine times; this was believed to cure scrofula, rickets and other illnesses.